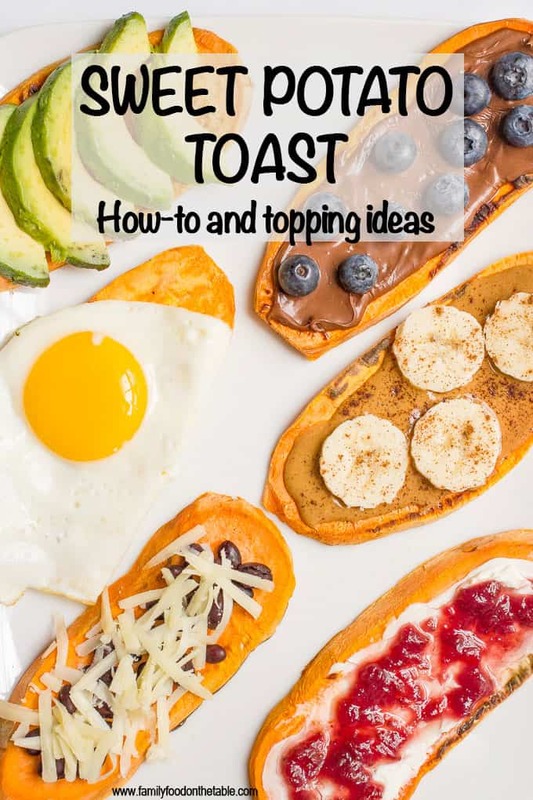 How to make sweet potato toast, some troubleshooting tips, and lots of sweet and savory topping ideas! 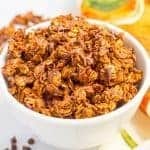 It’s perfect for a delicious, healthy breakfast or snack (that’s also gluten-free, vegan, paleo and whole30). Hi friends! I have a game changing recipe to share with you today. I didn’t believe this whole sweet potato in a toaster thing myself until I tried it. And then ate it for breakfast every single day for a week straight. I can’t stop – it’s so easy and so good! It’s also gluten-free, paleo, Whole 30 and vegan-friendly. 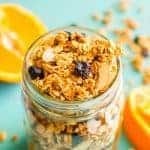 And it’s an amazing, healthy way to start the day! 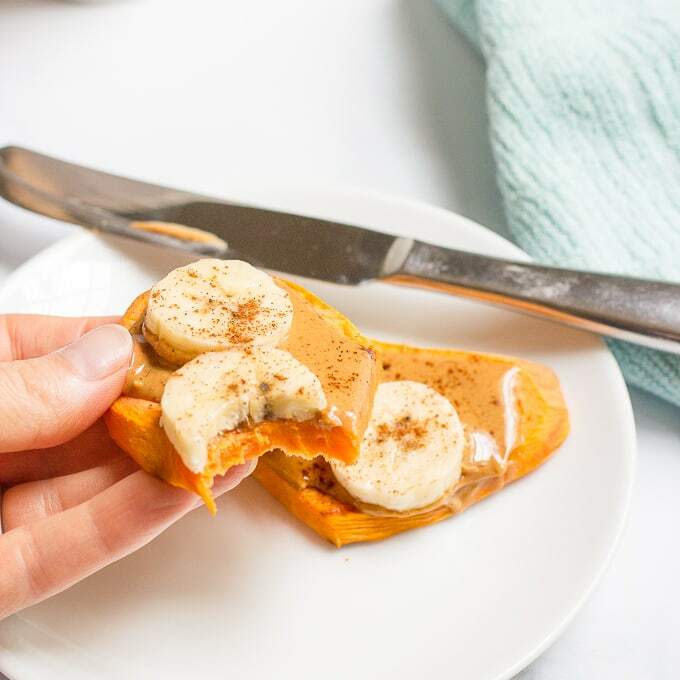 So today I’m sharing with you how to make sweet potato toast, some tips and troubleshooting, and lots of different ideas for toppings, both sweet and savory. Pay attention when you’re buying your sweet potato. Nice large round ones work best because you can get good slices out of them. Misshapen or curved ones aren’t as good for toast because you’ll waste more of the sweet potato. I prefer mine peeled (I just use a regular potato peeler) but you don’t have to. Slice your sweet potato into 1/4 inch long vertical slices. Thicker ones won’t get cooked all the way through in the toaster. Be sure to use a really nice sharp knife to make the cutting easier. Whoops, you sliced it too thick? You can pierce the slice with a fork a few times and microwave it for 20-30 seconds before you toast it. This helps to cook it a little so it won’t be raw in the center while still giving you the toasted marks. Turn your toaster all the way up to HIGH. Yes, all the way, as high as it goes. Trust me. Toast your slices at least TWICE. If your sweet potato toast doesn’t seem cooked all the way through or hasn’t browned, you can run it through a third time. Won’t hurt it one bit. In fact, I usually toast mine three times. Long pieces may stick out a bit from the toaster. That’s OK. I just flip them over in between toasting, so everything gets cooked. – I slice the entire sweet potato and keep the extra slices in a plastic bag in the refrigerator. They keep for over a week and are ready to toast straight from the fridge. – No, it doesn’t taste raw or tough at all in the middle. Just soft and sweet and tender and delicious! Psst… If you love sweet potatoes like I do, check out my quick and easy maple cinnamon sweet potatoes, my bourbon sweet potato casserole and my friend Rebecca’s melting sweet potatoes. 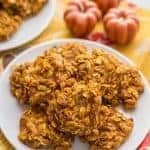 Or if you love tasty breakfasts like me, check out my oatmeal raisin breakfast cookies and my banana bread baked oatmeal. I also want to try these gluten-free pull-apart cinnamon rolls! 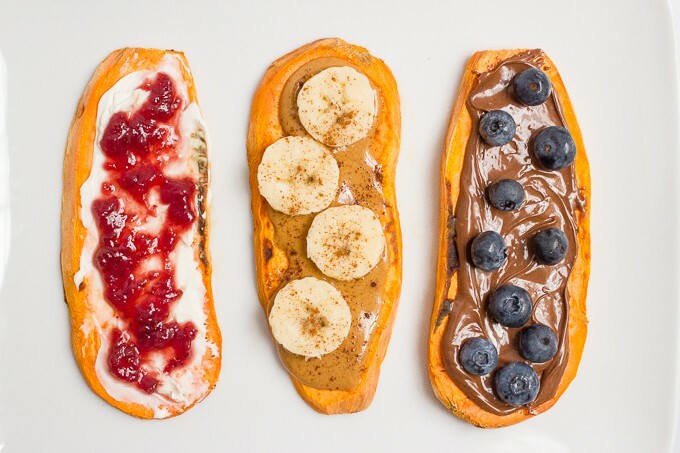 Now for the toppings on your sweet potato toast. Cause it’s all about the toppings! 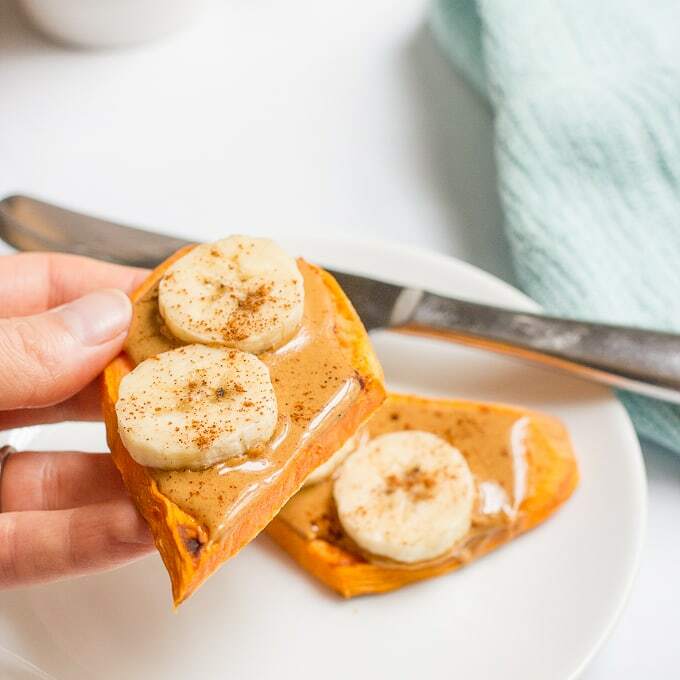 I really hope you’ll give this sweet potato toast recipe a try soon! I’d love to hear what you think and what your favorite toppings are. Check out my UPDATED VIDEO! 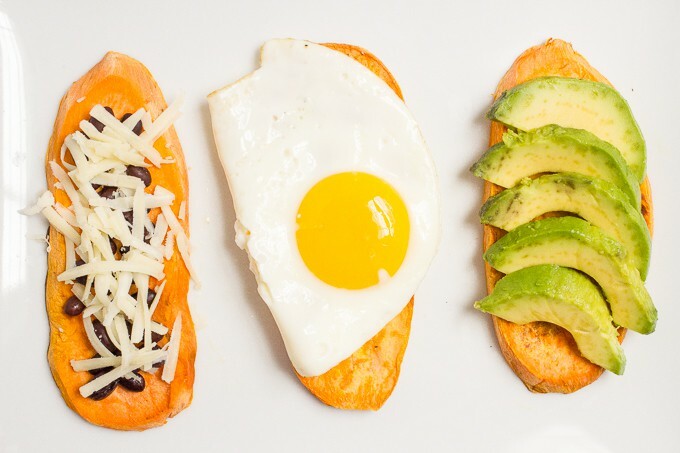 Sweet or savory, sweet potato toast makes for an easy, fun breakfast! Favorite toppings, such as peanut butter and banana, nutella and berries, avocado, a fried egg, etc. Slice sweet potato into 1/4-inch long vertical slices. 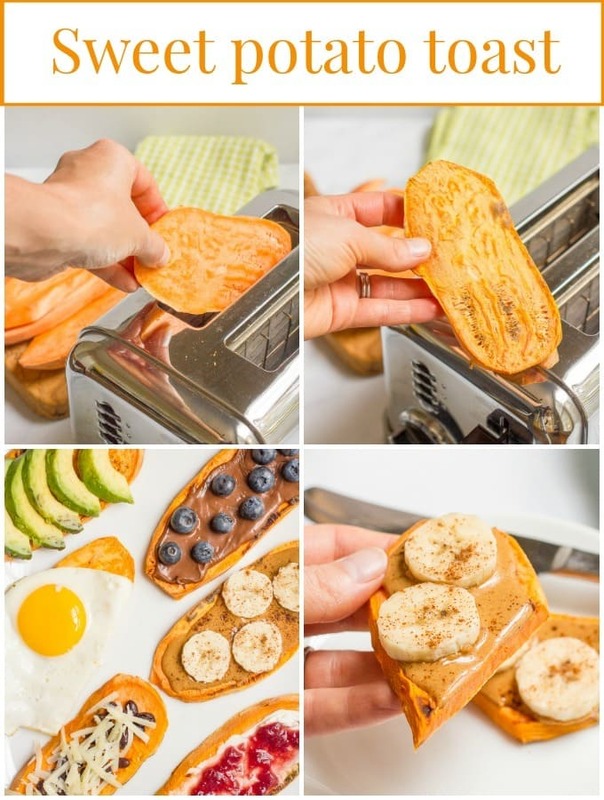 Turn the toaster all the way up to high and toast sweet potato slices twice. If yours isn’t fully cooked or slightly browned after two times, toast it a third time. Top with your favorite sweet or savory toppings and enjoy! Extra uncooked sweet potato slices can be stored in the refrigerator, in a plastic bag or container, for up to 10 days. See the post above for lots of additional tips, troubleshooting advice and topping ideas. Lots of people are doing it now, but I think the idea originally came from Little Bits Of. Haha, NOOOO not you too! How can you not love this Rebecca?!? It’s quickly become a staple in our house! You did a great job on your video, by the way! High five!! I SOOO need to try this!! You gotta do it Tara! It’s amazing! Looooove making sweet potato toasts. They make a great dessert with a schmear of chocolate spread. 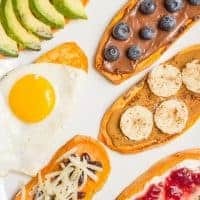 I am definitely going to be hopping on the sweet potato toast train after seeing these pictures. This is so creative! I never would have thought to use sweet potato as toast. I bet it is so good toasted! It’s great! Gets completely cooked and tender, but has a few good browned spots – so yummy! What a creative idea! I can’t wait to try these and experiment with toppings! I’m all about the toppings 😉 Hope you give it a try! Will it work in a toaster oven? Yes, I think it would work just as well in a toaster oven! 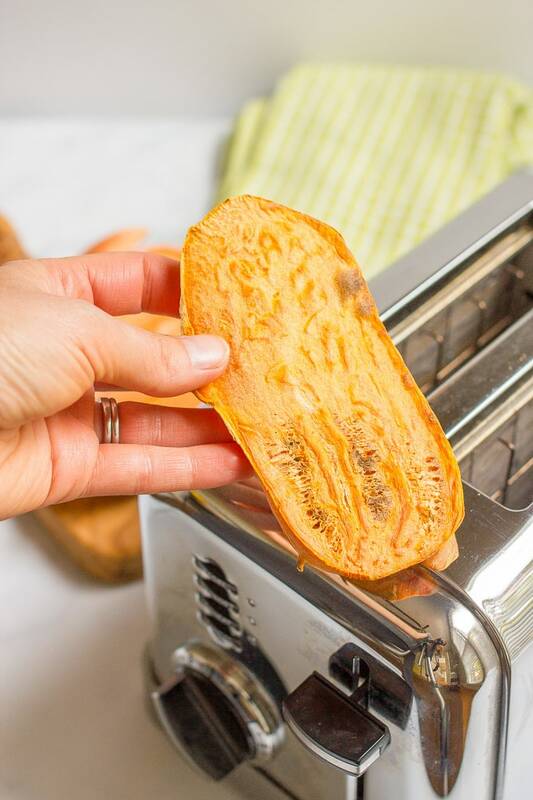 You’ll just need to see how long/how many times to toast it in the oven to get the sweet potato cooked all the way through and slightly browned – will just depend on how your toaster oven cooks. Hope you try it and let me know how it goes! Isn’t Kelsey’s idea brilliant!?! I love that she created this! Your take on it is awesome too! Love the toppings! Yes, so brilliant! It’s been such a fun new breakfast – and snack – for us! LOVE this post! So many different varieties! My 5 year old daughter saw these pics and said, “those look good!” Winner! I tried this back when Kelsey posted it and was blown away. Who would of thought it!? Love your idea of black beans and cheese! Right?! Such a very cool idea! And yes, I love sweet potatoes with black beans in all forms! This such a cool idea! I definitely have to try it. We went years without a toaster for some unknown reason and we’ve been obsessively toasting ever since we got one hahaha. Can’t wait to make this tomorrow morning! Haha, this is a great way to break in your toaster Amanda! Hope you love it!! I tried this and i think it works better if you turn the toaster down a fraction and cook 3 times. I found the edges were getting crispy and the centre still wet. Oh interesting… I tried turning mine down once and it didn’t cook it through or get any toasted parts at all. But all toasters are a little different – thanks so much for sharing your tip and I’m glad you found what works for you! I happened to have a cooked but overly sweet Japanese white sweet potato when I read this article. Since I wasn’t going to eat it (I thought and a shame since I had planted them in the garden lol) I sliced it up and fried in a bit of butter on the cast iron grill and wow! it tasted like French Toast! I topped a couple slices fried with some fermented bananas and gojis and even my carb addict hubby liked it. I just tried this and had to comment before I’ve even finished eating! It worked out perfectly for me. I toasted each slice 3 times. It was completely cooked and I topped the “toast” with scrambled eggs and avocado! This will change my life! I’m so happy to hear that Amy! It’s pretty amazing, right?! I don’t have a pop up toaster. 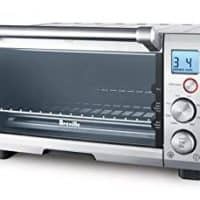 Would a toaster oven work for this? It looks delicious!! Hi Lee Ann – I haven’t tried it in a toaster oven but I think that should work just fine! You may need to play with the temperature settings and decide if 2 or 3 times of toasting is right for yours. Hope you try it! I hope you do Kristina – it’s pretty amazing!! Do you slice with a knife or a cheese slicer? Hi Joy, I use a knife to slice the sweet potato. Just make sure it’s sharp and watch your fingers! I am having a real hard time slicing it. I wish you would have included in this info tips on how to slice. I am a senior and this sounds great but I cannot seem to slice it easily. Any suggestions? preheat sweet potato? Hi Sharon! Yes, raw sweet potatoes can be difficult to slice since they are so hard. I have trouble with squash too. My best tip is a really large, sharp knife. You could also microwave the sweet potato for 1-2 minutes to soften it a bit and make it easier to slice. I hope that helps! Yes, that helps, I so thank you for responding and understanding. It might help to cut or use your peeler to make a flat base to put on your cutting board. It does waste a bit of potato but it can really help with cutting. That’s a great tip! Makes it more stable and a little safer to cut, too. Thanks Mary Ellen! This toast was so yummy and being gluten free was a great alternative to bread. Lovely. I’m so glad to hear you loved it Rowena!! Does it not drip and juices into the toaster? 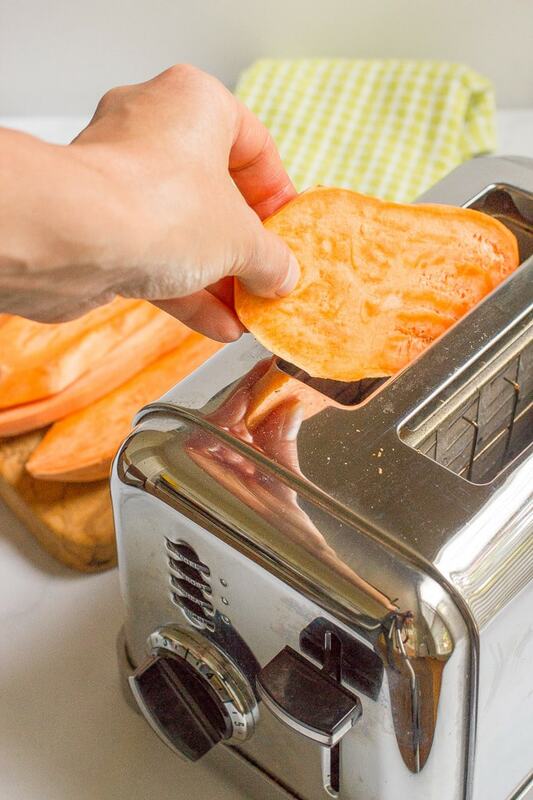 Nope – the sweet potato slices don’t release any liquids while toasting. Hope you give it a try! I certainly will…. thank you!! This is amaZing! I LOVE sweet potato and I hate when I crave some and then have to wait forever to eat it. I NEVER thought to toast it! Thank you! I know what you mean – I’m not a very patient person 😉 This is such a great way to have it any time! Thanks for the recipe! I’m going to try this! Yay! I hope you love it Rosalind! Just tried this and after toasting I pan fried it in coconut oil for a a minute or so on each side. It was delicious. Oh yum! That sounds like a delicious way to finish it off Sara! I started the Whole 3o a couple of days ago and was looking for different types of things to make for breakfast. I found this on Pinterest. I made my first sweet potato toast today and topped it off with cashew butter, cinnamon, and coconut flakes. So yummy! Thanks for sharing your wonderful idea! What do you do about the potatoes falling through the slots? Hi Kathy, the sweet potato is cut into large slices so I don’t think that should be an issue. 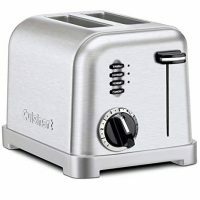 I have both a stand-up toaster (as pictured above) and a toaster oven and haven’t had a problem with the sweet potato slices falling through any cracks. Well. I tried making these in the toaster which was a BAD BAD idea! Got one slice STUCK in the bottom of the toaster, which was nearly impossible to get out. I wrestled with that toaster in a hot kitchen with various utensils for almost 30 minutes. If I had to do it again, I would have taken a screwdriver and disassembled the toaster to get it out. I am never putting anything other than bread in there again. Oh, and the rest of the sweet potato slices went under the broiler and got cooked that way. Oh Becky, I’m so sorry! It helps to use longer sweet potatoes (and rotate them end over end during the toasting) because I’ve had smaller ones not pop up too. Usually I just unplug the toaster and use a knife to pierce it and pull it up – I’m sorry yours got so stuck! oh m god oh my god! I’m so excited about trying this. This is my kind of splurge-will make it even at night when I just need a little more extra after working out and I’m still famished. I hope you do try it Marfi! 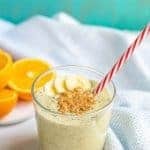 It’s definitely addicting and would be perfect for an evening post-workout snack! I couldn’t get my slices to cook all the way through, even after large black splotches started to appear on the outside. They were about the same thickness that you instructed, and I poked holes and microwaved the slices that seemed thicker, so I’m not sure if it’s just me, or maybe my toaster? I’m not sure what to do differently. Any suggestions? I suppose I could bake the slices instead, since I love sweet potatoes! Hey Carmen! I’m sorry it didn’t work for you. When I do my slices thin enough, turn the toaster oven ALL the way to high and run it through three times, it always works. I’ve used a few different toasters, too. Maybe it’s a wattage difference between toasters? I’m especially surprised it didn’t work when you microwaved first. If you try it again and still can’t get it to work, maybe it’s a toaster issue and baking them off would be better. Good luck! Hi Kathryn, I really loved this recipe and the photographs. I am an illustrator and love to paint food, so I painted the sweet potatoes and shared it in my social media with links to this page, of course. Would you mind if I put the artwork in my portfolio? Hi Nazuba, what a cool thing, to paint pictures of food! However, I own the copyrights to my photography so I can’t just let you use my images. I hope you understand. 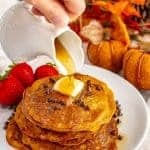 I love your video 🙂 I would never have thought of doing this, I’m on a paleo diet and fed up of the breakfasts on offer but I love sweet potato and I can’t wait to try this. Thanks! I finally got around to trying this last night & am so glad I did! I had to toast them three times & trim of some of the blackened edges, but it was worth it. I topped mine with cream cheese & a sprinkle of stevia & cinnamon – I could have sworn it was a dessert! Thanks for such a great idea! Tara here, I just found your site while looking for quinoa bites…success by the way. My little in Ei’s 12 months this weekend and we’re beginning our journey into more adventurous table foods after mostly bf for this first year. So far I am super excited to try the quinoa bites, overnight oatmeal jars and the seeet potato toast…mostly for me, but I think he’ll be able to start in on all three of these even if just a little this first go round. Thank you for your beautiful and so helpful site, we’ll be trying these this eeekend and I’ll be back for more soon! Good things it’s grocery shopping day! 💗Take care and thanks again!!! Hi Tara! I’m so happy you found me and to hear the quinoa bites were a success! Thanks so much for sharing! And yay, I hope you find lots of other recipes to try out! It’s so fun when they start feeding themselves and picking up foods and just getting into that whole stage. Can be messy, but it’s so cute! Absolutely let me know if you ever have questions or if you want to see a recipe! 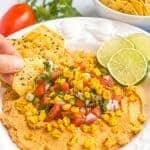 I’m revamping my homemade baby food series right now (familyfoodonthetable.com/homemade-baby-food) and hoping to add a post soon on our favorite finger foods 😊 Have a great rest of the weekend! Such a fun and creative idea. I love sweet potato. O M G ! ! ! ! ! ! THIS IS A W E S O M E S A U C E ! ! ! This might be a silly question, but do you eat the skin of the sweet potato? Hi Amy! I peel my sweet potato to remove the skin and then slice it, but the skin is edible! And in a thin slice like this would probably be fine. Hope that helps! How do your cut the sweet potato so easily? I’m wrestling mine… definitely not pretty and even like yours. Hi there! Sweet potatoes can be tough to cut. My best recommendation is to have a REALLY sharp, good quality knife! I am finally going to do this – right now! So excited! Just peeled my potato! Fried egg on top with avocado slices – W30 breakfast – easy peasy! Thanks for the video! One question – whenever I peel a bunch of sweet potatoes to roast cubes for hash, they get brown spots on them almost immediately. You store your slices in the fridge for 10 days…..no brown splotches? Yay, I’m so happy to hear you love sweet potato toast too! I know what you mean about brown spots, but I don’t get any on my slices. I always peel and slice an entire sweet potato and just put the extra raw slices in a ziploc bag and stick it in the refrigerator and it’s good to go. Hope that helps! I love sweet potato. Great way to get it hot and as many times a week or a day as I want. Absolutely! And so many ways to change it up! Hi! How do you get the sweet potatoes so thinly sliced? Is it just a good eye and steady hand or is there a tool for it? Hi there! Sweet potatoes can be tough to cut. A really sharp knife helps a LOT. 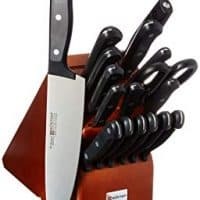 (And don’t be scared of it – sharp knives are actually much safer than dull ones.) Also, a trick I sometimes use with squash, such as spaghetti squash, is to microwave it for a few minutes first, before trying to cut it. It softens just a little and helps the knife slice it better, so you could try that as well. Hope that helps! I tried this for the first time today. My Husband and I made our lunch at the same time. I topped one of my ‘toast’ slices with PB and Nanna, and the other with the left over tuna from his sandwich. I am so in love! this was awesome. My GenX husband is… perplexed by my “Millennial toast”. He refused to try it. He doesn’t know what he’s missing. Poor him. Poor him but more for you! I’m so happy to hear you enjoyed it Linda! Sounds like a delicious lunch! hi! 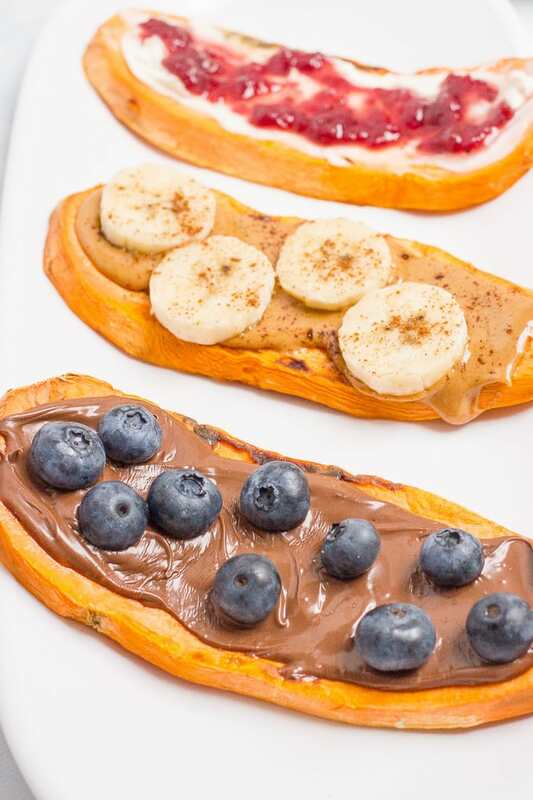 I’m confused about the nutella spread on the sweet potato toast? Doesn’t the 30 for 30 say not to eat anything with added sugar i.e nutella? 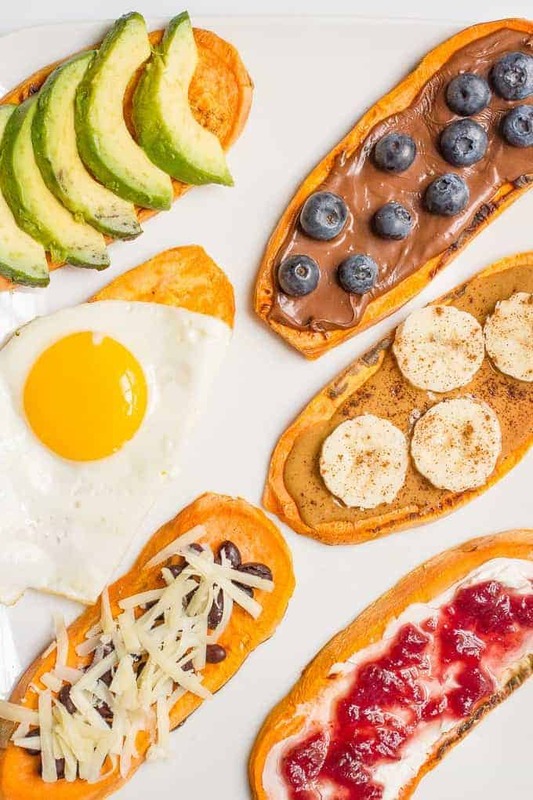 Hi Corinne, if you are following a specific diet or dietary plan, you’ll need to choose your desired toppings for the sweet potato toast accordingly. Hope that helps! Love the sweet potato toast too! I am not fond of the peel though. You mentioned you don’t either…Do you peel it off after cooking in toaster or before? Yes, so I peel the whole sweet potato and then cut it into slices. I use 1-2 and then put the rest in a plastic bag in the fridge for using later in the week. They keep great!